Do you want to replace an image that you previously uploaded in WordPress? Sometimes you may upload an image to your site, and then you want to re-upload it with few tweaks. Instead of uploading a new file every time, you can simply replace it. 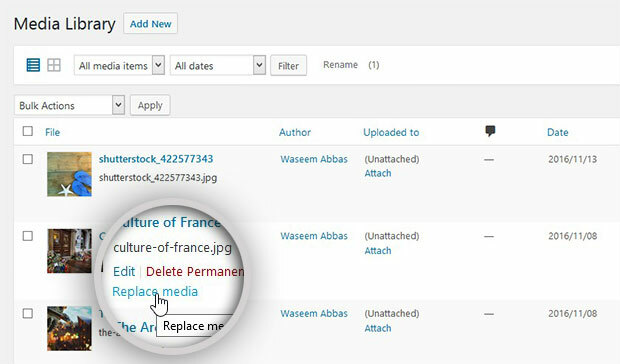 In this article, we will show you how to replace your photos and media files in WordPress. By default, WordPress does not allow you to replace photos or media files. 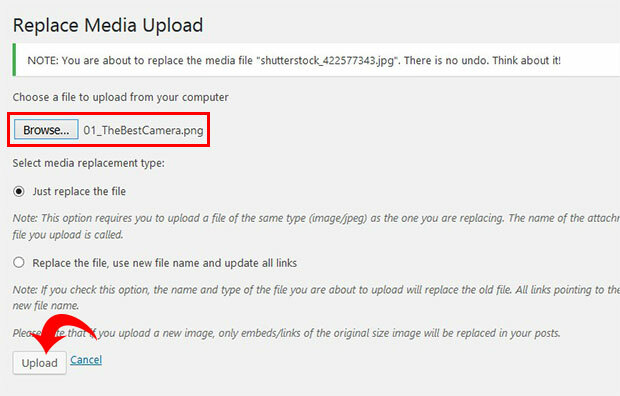 To update previously uploaded files, you’ll need to use a plugin like Enable Media Replace. First thing you need to do is to install and activate the Enable Media Replace plugin to your WordPress site. To install this plugin, you should go to Plugins » Add New from your WordPress backend. In the search bar, you should write Enable Media Replace, and the plugin will be displayed below. Click on the Install Now button for the plugin, and then hit the blue Activate button. Upon activating the plugin, you can go to Media » Library from your WordPress admin. By default, the photos are in grid-view. Go ahead and change it to list-view. Hover over the image or media file you want to replace, and you’ll see the Replace Media option. Simply click on it to replace that media file. You will see a new page with the option to browse to a new media file to replace with an old one. Click on the Browse button, and select the new file from your computer. You will also see two options. You can choose to just replace the file, or you can replace the file, use new file name, and update all links. Select your preferred option from these two radio buttons. Then, simply click on the Upload button. It will replace the image for you. That’s all. We hope this article has helped you to learn how to replace your photos and media files in WordPress. You may also want to check out our guide on how to sort image galleries in WordPress albums. Hey, can you please explain what you are trying to say? Hi I am trying to upload and REPLACE 800 images in my media library. The Media Replace Plugin only allows me to replace one image at a time. Is there a plugin that would allow me to do a bulk image upload and replace? Hey Jacob, the purpose here is to put up an image by replacing it to another image that was previously uploaded. Can you please explain more on how you want to replace 800 images in one go? can I disable “Enable Media Replace” Plugin permanently after all images have been replaced ?